AEC is recognized as the leader in the specialty field of Category Management with a customer portfolio that includes; Barnes and Noble, Rite Aid, Kmart, Meijer, Brandsmart USA , Sears, Whole Foods. The VMI management team has extensive experience in the marketing and sales of home entertainment products and, as a team, has worked together for more than twenty years. AEC works as a partner to provide a solution tailored to the client while working within the boundaries of the retailer's corporate culture. AEC's marketing solutions are customized and flexible to achieve each account's specific needs and goals. Our solutions include; complete on-going program solicitation and execution, exclusive programs based upon specific releases, programs based upon specific events, programs designed for a particular type of consumer and in-store permanent and promotional signing design and production. Ensuring that any recent shipments have been correctly merchandised. Executing promotional setups, price-changes and RTV's. Replenishment-Type Logic determines the appropriate replenishment algorithm for trending SKU's based on desired weeks of supply strategy. Each store has a volume code for each category, which is recalculated weekly based on actual performance. These volume codes are used in matrices representing product allocations, minimums, maximums, or reorder points assigned to execute a specific task. Utilizing daily POS data, transmitted via EDI, AEC monitor's sales and makes any necessary adjustments to models replenishment orders. The VMI system identifies hot selling titles and sales trends by store, enabling rapid replenishment. 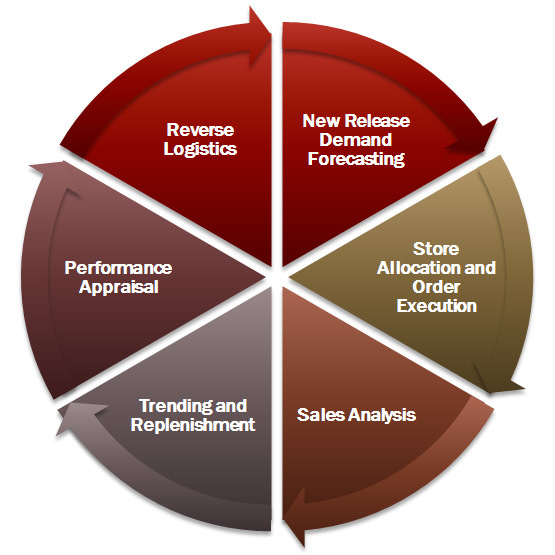 Store specific replenishment orders are generated based on a combination of, model stock levels and sales trending.